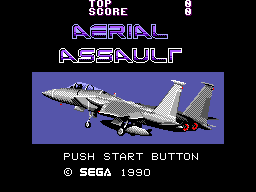 If there is one thing Sega ever was good at, it was shooting games. 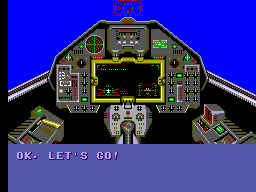 Both SMS and MD/Genesis were full of shmup miracles that can be still considered playable. Aerial Assault is no exception. You are seeing a solid shooter with many features, cool graphics, great music and a rarity: great manual design. 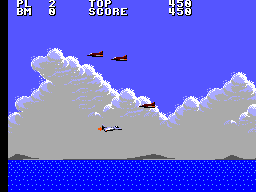 In the game you are a mysterious Pilot pilotting a state of the art fighter plane called "Freedom Fighter". As far as I'm concerned it looks a little too much like F-15 but whatever. You are fighting against a terrorist organisation called "N.A.C." Don't ask the meaning because I couldn't find what it means despite the fact that I checked the very page of the manual. In five explosive levels, (4, if you are playing Easy difficulty) we will try to get the world rid of this menace. Typical shoot'em right. Your jet for some reason, can move even backwards and move like a VTOL. But there's nothing wrong with that right? After all all planes were like that until 90ies... at least in the games. Ahem. There are many weapons for you to use in the game. From straith shooting guns to weird 8-way cannons, bombs to napalms, missiles to lasers, more than 15 different power up is awaiting you. Over 5 stages you will of course, come across bosses. These include a large battleship, a gigantic bomber (which I might add still wonder how can something that big fly) a mountain fortress , a gigantic laser cannon and finally a space cruiser. (Yes, you are going to space... Some fighter, eh?) You can expect the bad guys will throw everything they have at you. Ships, bombers, helicopters, tanks... you name it, they have it. Nice. Really nice. Most of the military hardware you can see in the game drawn realistic. Even the explosion graphic you see when you plane blows up is possibly the best in SMS. But most important detail is given to the bosses. That giant bomber I just mentioned, I'm not sure but I think I saw the face of "Masked Ninja" in the tail. Oh and, not an important detail but, you plane looks a little different in the game itself. F-15 was not delta-wing plane as far as I can remember. For an SMS shooting game, it is more than you can ask for. Obviously composers worked hard to make an unfogettable score with SMS' limits. Boss tune of 4th level is possibly one of the tunes I can remember after playing dozens of games in my SMS. Sound effects are not to be neglected either. Missiles, lasers, explosions, all faithfully depicted in the game. Easy to master. First button is used to fire main weapons while second button is used to fire your secondary weapons. Game has several power ups which can increase or decrease your speed, depending on your reflexes. You'll be amazed to see how you dance through everything they throw at you. We are talking about one of the most beautiful shooting games in 8-bit consoles. With that many weapons for you to use, you might want to enjoy the experience and blast those petty terrorist again and again. Just make sure you play with the normal difficulty level or above, so you can enjoy the final battle in the space. 5 long levels of shooting combat. Oh yes! Sega and shooting games. What is more there to say? I suggest you to take a look at the manual as well when you have the time. It is written with a very humorous tone, not like many other SMS manuals around. With this much good trait, Aerial Assault is a worthy addition to your SMS library. Just insert the cartridge and play along. You will see that cockpits are not that silent as they look.